Mario Tellez is tired of party boys, and he’s had his eye on Tom for a while. 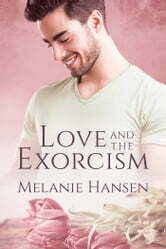 When they run into each other at the Ex-orcism, sparks fly, until an accidentally overheard conversation drives Tom to do something he normally doesn't do. What should have been a hot and fun night turns into Tom and Mario seeing each other at their absolute worst, although surprisingly, it brings out the best in them, too. Navigating around the toxic people in their lives isn’t easy, and after a small series of bumps in the road, they finally come around full circle… to Valentine’s Day and laying old demons to rest.